THIS DAY IN RMR HISTORY: The Battalion history, however, tells us that “Snipers were active throughout the tour, four men of the 14th being hit and many others escaping by narrow margins. On July 6th British forces to the right feinted an attack to draw enemy troops into an area where artillery could deal with them, the 14th Battalion ‘standing to’ during this operation, and No. 3 Coy. reinforcing the front line. 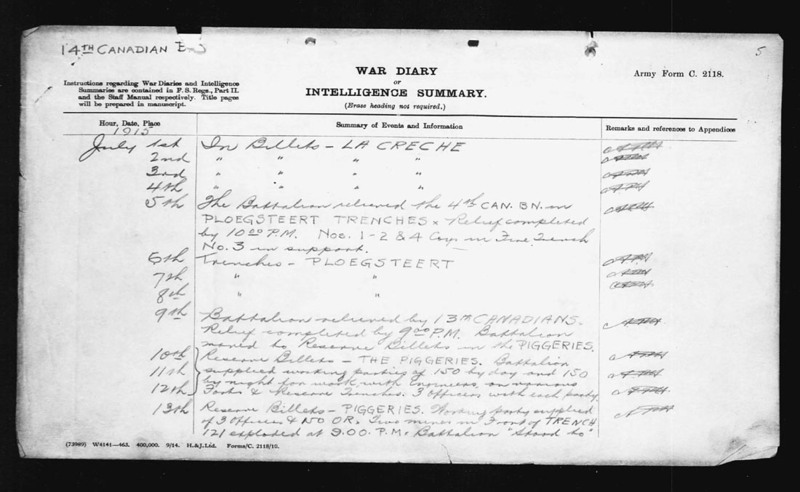 Unfortunately, a Canadian battery fired short during the ‘stand to’, several shells crashing into the Royal Montrealer’s front line and inflicting casualties. “Introduction: Francis Pegahmagabow (9 March 1891-5 August 1952) was the most decorated Canadian First Nation soldier in the First World War. 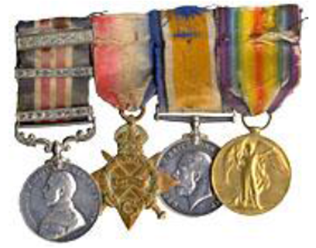 He was awarded the Military Medal (MM) plus two bars for bravery in Belgium and France. Pegahmagabow was one of 39 members of the Canadian Expeditionary Force (CEF) to receive two bars to the MM. He was the most effective sniper of World War I on either side. He was an expert marksman and scout, credited with killing 378 Germans and capturing 300 more. Early Life: Francis Pegahmagabow was born on what is now the Shawanaga First Nation reserve. 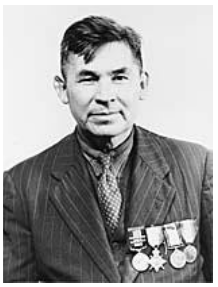 His father was Michael Pegahmagabow of the Parry Island First Nation and his mother, Mary Contin of the Henvey Inlet First Nation, located further up the Georgian Bay’s north shore. An Ojibwa, he grew up at the Parry Island (Wasauksing) Band, near Parry Sound, Ontario. Prior to the war Pegahmagabow worked as a marine fireman for the Department of Marine and Fisheries on the Great Lakes. Wartime Experience: Pegahmagabow enlisted with the 23rd Regiment (Northern Pioneers) in August 1914, almost immediately after war was declared. Within weeks of volunteering, he became one of the original members of the 1st Canadian Infantry Battalion, which, along with the rest of the 20,000-strong 1st Canadian Division, landed in France in February 1915. The 1st Battalion experienced heavy action almost as soon as it arrived on the battlefield. It fought at Ypres, where the enemy introduced poison gas, and on the Somme, where Pegahmagabow was shot in the leg. He recovered and made it back in time to return with his unit to Belgium. Pegahmagabow was one of those rare Canadian soldiers who enlisted in 1914 and fought to the end of the war. Post-War: In April 1919, Pegahmagabow was invalided to Canada, having served for nearly the entire war. Afterward, he joined the Algonquin Regiment in the non-permanent active militia and, following in the steps of his father and grandfather, became chief of the Parry Island Band and later a councillor. He is remembered for ensuring that the culture of his people was not lost and, while chief, he encouraged the study and practice of the band’s traditions. During World War II, he worked as a guard at a munitions plant near Nobel, Ontario while serving as a Sergeant-Major in the local militia. 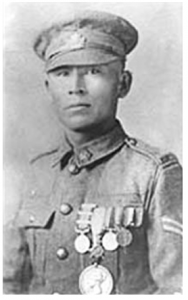 A member of Canada’s Indian Hall of Fame, Pegahmagabow died on the reserve in 1952. In Memoriam: In a ceremony held 27 August 2003 at the Canadian War Museum (CWM), Corporal Francis Pegahmagabow’s medals were donated to the Museum by his children, Marie Anderson and Duncan Pegahmagabow. Included in the donation were his wedding certificate and photo album, as well as his headdress from his service as chief of the Parry Island Band. His memory is also commemorated on a plaque honouring him and his regiment on the Rotary and Algonquin Regiment Fitness Trail in Parry Sound. At present (2015) plans are well underway to erect a life-size bronze statue of Corporal Pegahmagabow, to be unveiled in June 2016, which will stand at the Charles W. Stockey Centre for the Performing Arts in Parry Sound, in view of Parry Island, Pegahmagabow’s home. R.C. Featherstonhaugh, The Royal Montreal Regiment 14th Battalion C.E.F. 1914-1925, Montreal, The Gazette Printing Co., Ltd., 1927, pp 63-64.